An update to NETransit yesterday now lists MBB cars 1500 and 1503 as inactive. This is interesting, since there are currently no Rotems in service as fully-functioning cab cars. Perhaps since there has always been a surplus of CTC's, the Rotems have enabled the first MBB's to be retired, and these CTC's were selected first since more effort (and money) is required to keep them in service vs. BTC's? It appears that the beginning of the end for the MBB cars has come. A bit odd, since late in the week of the 9th an employee commented to me that the Rotem cab cars were no longer allowed to be used as such. jbvb wrote: A bit odd, since late in the week of the 9th an employee commented to me that the Rotem cab cars were no longer allowed to be used as such. See the Rotem thread: Our moderator has noted a possible fix is about to be tested. How long have the MBB's been on the system? I don't think I've ever been in one. Mbta fan wrote: How long have the MBB's been on the system? I don't think I've ever been in one. They are the single-levels with restrooms. Every one of them on the roster, including all MBB cab cars, has a restroom. And none of the Pullmans and Bombardiers have them. So if you have ever been in a single-level car with a restroom...that's an MBB. The only other cars on-roster with restrooms are 33 Kawasaki blind bi-levels, and the brand new Rotem blind coaches. The MBB's are split in equal numbers northside and southside to cover the 1 restroom per train accessibility requirement, and run on all lines. Old Colony, however, only uses the 1500-series cab car MBB's because none of the 500-series blind coaches were modified with power doors. They are the only single-level, power door-equipped cab cars assigned to Greenbush, Plymouth, or Middleboro...so if the rear car on any train on those routes is a single level, it's a guaranteed MBB. If it's an all single-level consist on any line...it's a near certainty to have at least one MBB. If it's a mixed bi-level consist on any line that doesn't contain a 900-series Kawasaki blind coach...it's a near certainty to have at least one MBB. They've been around since 1987. Good cars during their service life but they're in very poor carbody condition now...rotting floors, heavy corrosion...which make them unsuitable for a rebuild program. Pretty much anything else old on the roster is in decent enough structural shape for re-sale and rebuild with somebody else. But the MBB's can't get to their date with the blowtorch fast enough. Old Colony, however, only uses the 1500-series cab car MBB's because none of the 500-series blind coaches were modified with power doors. They are the only single-level, power door-equipped cab cars assigned to Greenbush, Plymouth, or Middleboro...so if the rear car on any train on those routes is a single level, it's a guaranteed MBB. If it's an all single-level consist on any line...it's a near certainty to have at least one MBB. If it's a mixed bi-level consist on any line that doesn't contain a 900-series Kawasaki blind coach...it's a near certainty to have at least one MBB. The 1500s also the only single-level cab cars equipped with cab signals and ACSES. All the 1600-series Bombardier cars are on the wayside-only North Side, thereby skewing the 1500/500 breakdown. 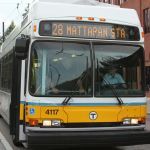 NETransit currently lists 23 blinds and 3 cabs North, and 9 blinds and 18+10 cabs South (manual + power doors for Old Colony). Thank for the info f-line and Ty. 507 has been removed from service as of 10/29. As I understand it, the 1525 was in BET being stripped too. Are these (the MBB's...I know 1710 was wrecked beyond repair) previously long-term kaput units they're just clearing out of the dead line to free more storage space? Or is the angel of death starting to actively tap the shoulders of the few worst-of-the-worst serviceable units? The cars being stripped have been cars sitting stored for sometime. The 1525 was heavily parted out about 5 years ago and has roamed around BET ever since. The 1503 is also out of service and is to be stored, not scrapped. 1503 is currently on the same track as the old Budd cars; about 20 feet away from them. Apparently "inactive" really only means "retired from passenger service" and not completely OOS. 1500 was spotted on the south side wash train today.